Costa Rica celebrated qualification for next year’s World Cup finals in Brazil despite a stoppage time equaliser from Jermaine Anderson giving Jamaica a 1-1 draw in their CONCACAF qualifier. ‘Los Ticos’ were just moments away from being able to celebrate on the field in Kingston before Anderson struck for the bottom placed Reggae Boyz. But the 2-2 draw between Honduras and Panama, played one hour later, ensured that the celebrations could begin in earnest as Costa Rica earned their fourth World Cup finals appearance after 1990, 2002 and 2006. TPL leading scorer Carmelo Gonzalez was on target yet again as the Spanish forward scored four times in Buriram United’s convincing 5-1 win over Samut Songkhram. The win, which also saw Spain-born Philippines international Javier Patino find the back of the net, comes just days after Buriram returned home following their 1-0 loss in the first leg of their AFC Champions League quarter-final meeting with Esteghlal in Tehran. 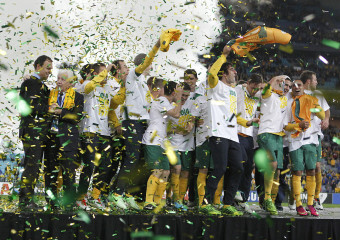 A trademark header from forgotten striker Josh Kennedy has booked Australia’s ticket to next year’s World Cup in Brazil after a vital 1-0 win over Iraq at a packed ANZ Stadium on Tuesday night. Needing a win to assure a spot at a third straight World Cup, the Socceroos looked like blowing their chance as the stubborn visitors held firm for more than 82 minutes. But in his first Socceroos appearance in 19 months, Kennedy came off the bench to nod home Mark Bresciano’s cross seven minutes from time to send the crowd of 80,532 into delirium. 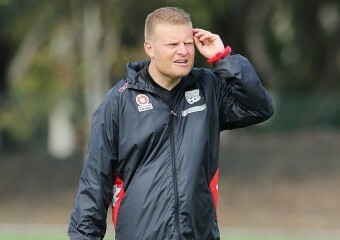 Former FC Barcelona academy mentor Josep Gombau has been appointed as Head Coach by Adelaide United coach for the next two seasons. The Spanish-born Gombau will begin with the Reds in July once his commitments with Hong Kong first division champions Kitchee SC are concluded with his current assistant Pau Marti who will be joining the coaching staff alongside current Reds assistant Michael Valkanis.